1. Preheat the oven to 200°C, gas mark 6. Mix together the chutney, Worcestershire sauce, Tabasco and mustard. Place the chicken on a baking tray and toss in half the sauce. Roast for 25 minutes or until cooked throughout with no pink meat. Drain off most of the juices from the baking tray. 2. 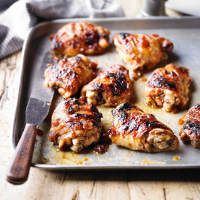 Brush the remaining sauce over the chicken and place under a preheated grill for 3 minutes until golden and sticky. 3. Serve with salad and new potatoes, drizzling over the leftover pan juices. More info: 1g fibre, 35.8g protein.